Take a deep breath: the interview is over! And if you’ve followed our advice up to this point, you really nailed it. Now you’re being seriously considered for the job, and the ball is in their court. Many job seekers dread the follow-up process and how to tactfully go about it. It’s easy to let anxiety take over as you wait patiently to hear from your potential new employer—don’t let it! You’re not powerless in this post-interview stage of the job hunt, you still have a few opportunities left to separate yourself from the pack. Even before your interviews are officially completed, it’s a good idea to have a short “Thank You” note ready to email after every interview. By quickly sending out a thank you note, you can demonstrate to potential employers that you are grateful for and understand the value of their time. It also demonstrates how enthusiastic and serious you are about the potential position. Here is a great resource with Thank You letter templates, ideas, examples and more! If during the interview you spoke about a project you worked on, but didn’t have the details on hand, this is a good chance to send that information over as well—just keep everything brief! Make sure your Thank You email is sent out within 24 hours of the interview. If the process seems to be taking longer than expected, reach out again expressing interest. However, make sure you are doing it in a calm, professional manner so that you do not inadvertently drive the potential employer away. Mention the date you interviewed and the position you interviewed for, and reaffirm that you think you’re a great fit for the company. After that last follow up, you’re only left with the most difficult step: being patient! 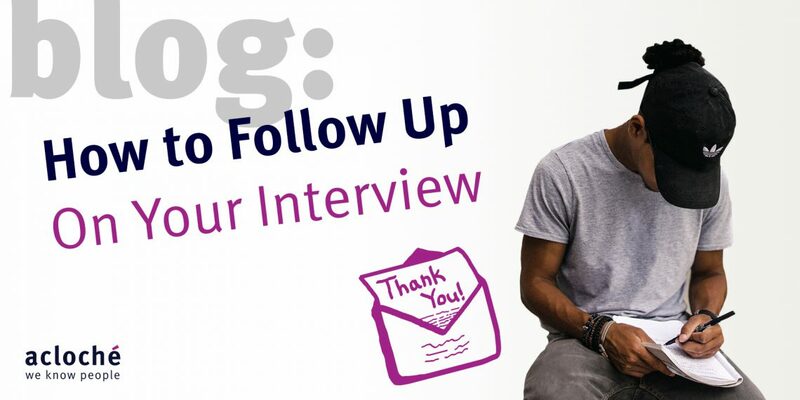 You’ve interviewed, sent a Thank You note, and followed-up to the best of your abilities. You have put yourself in the best position possible to land this new job. Stay confident and await their call!